Questioning Answers: "Spending constraints" a.k.a austerity and a mortality gap? "Spending constraints" a.k.a austerity and a mortality gap? I try not to be too political on this blog given the focus on peer-reviewed science and my notable lack of political interest or motivation. It is however difficult to completely separate science and politics from each other given the world that we live in. A world that still commonly uses the term 'austerity' quite a few years after 'the crisis', alongside a realisation that behind headlines on the continued drive(s) towards 'fiscal security' and 'balancing the books' there are inevitably going to be winners and losers. The paper by Jonathan Watkins and colleagues  highlights some of the extreme 'not winners' potentially stemming from the "relative constraints in public expenditure on healthcare (PEH) and social care (PES)" here in Blighty over recent years. 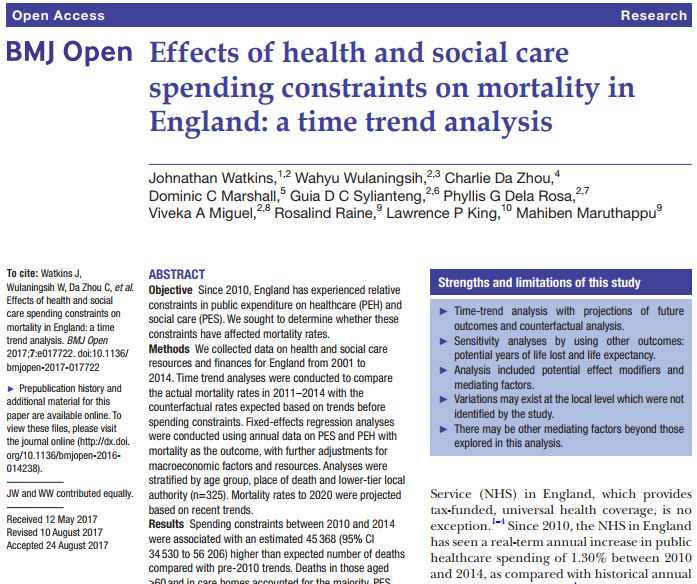 They concluded that: "Spending constraints between 2010 and 2014 were associated with an estimated 45 368 (95% CI 34 530 to 56 206) higher than expected number of deaths compared with pre-2010 trends." Further, that if current trends continue in relation to funding "approximately 150 000 additional deaths may arise between 2015 and 2020." Cue the sharp intake of breath as words such as 'economic murder' have been banded around in the popular press discussing this research (see here). I'm not going to go into all the details of the Watkins findings on this occasion. The data for the study was derived from various public databases in relation to population mortality, spending on health and social care and related variables. I don't doubt that as per other debates on the 'weekend effect' for example, different people with different mindsets might arrive at different conclusions based on such data. 'Lies, damn lies and statistics' is a phrase that springs to mind. With my very rudimentary reading and understanding of the Watkins data, I can't however see any obvious flaws in their methods or logic behind their results; aside that is from remembering that correlation does not always equal causation. Others have voiced similar sentiments (see here). "By setting, deaths at care homes and at home contributed most to the observed ‘mortality gap’, while hospital mortality was lower than expected." The authors specifically attribute such data to the gap between spending on social care vs. spending on health care; also noting that "the recent drive to move patients with poor prognoses and who have reached their ceiling of care away from the hospital environment to care homes or their own homes may have contributed to this." One interpretation of this is that those who are elderly and/or vulnerable placed outside of the hospital environment are perhaps disproportionately being burdened with the effects of austerity. And one possible solution? Well: "Our study suggests that the number of NHS-qualified nurses is the strongest tested mediator of the relationships between spending, and care home and home mortality." One solution but not the only solution. With a UK budget announcement set for later this week, I wonder if the Watkins findings might figure in relation to the suggestion that "a cumulative spending increase of approximately £25.3 billion would be required to close this gap across health and social care by 2020/2021, equating to around £6.3 billion annually." Yes, those are some quite staggering sums of money, but at the end of day what is to be valued more: balancing the books or plugging quite a significant mortality gap? (and even some of our elected officials seem to be interested in this debate). Watkins J. et al. 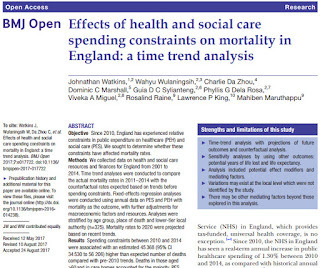 Effects of health and social care spending constraints on mortality in England: a time trend analysis. BMJ Open 2017;7:e017722.